Effective product management leaders know how to exploit major market changes. The rise of the subscription economy and software as a service (SaaS), and the widespread adoption of agile and lean concepts have put pressure on product teams to adapt quickly to meet customer needs and drive customer retention and recurring revenue growth. Product management leaders need to prioritize efforts to leverage flexible and fast product development engines as well as their increased digital proximity to customers. In this guide, we describe six assumptions that product management leaders should incorporate into their planning for 2019. This guide identifies five priorities for 2019 that will help advanced manufacturing marketing leaders demonstrate to product and sales peers how marketing can add value. 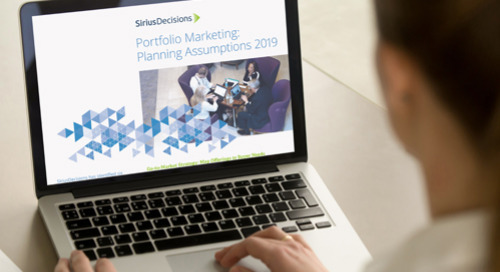 The SiriusDecisions 2019 Planning Assumptions uncover key trends, specific to each function of the revenue engine, that will help b-to-b leaders capitalize on opportunities and guide their planning. In this guide, we describe five key trends that will affect the priorities of marketing executives in the asset management industry in 2019. In this guide, we describe five key trends that will affect the priorities of marketing executives in the banking industry in 2019. In this guide, we describe five planning assumptions that brand and communications leaders should incorporate into their planning for 2019. 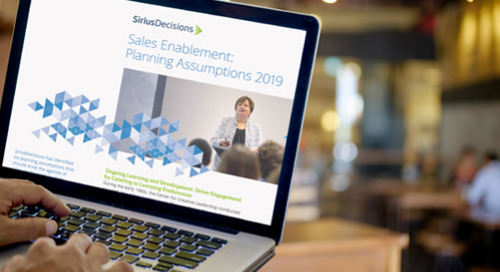 In this guide, we describe the five planning assumptions that channel sales leaders should incorporate into their planning for 2019. In this guide, we describe five planning assumptions that channel marketing leaders should incorporate into their planning for 2019. In this guide, we describe five important trends that will impact emerging-company marketing leaders’ priorities in 2019. In this guide, we describe five trends that healthcare marketing leaders should consider when planning for 2019. In this guide, we describe five key trends that will affect the priorities of marketing executives in the insurance industry in 2019.